More than two months have passed since Saudi Arabia and the United Arab Emirates, along with Bahrain and also Egypt, imposed a blockade on Qatar. The very public move was intended to force Qatar back into line with the Saudi-UAE regional outlook. But Qatar fought back. By diversifying its economy, solidifying its defenses, and aggressively internationalising the crisis, Qatar has demonstrated its clear intent that the blockade will have the opposite effect to that intended. The clash had been looming since the Arab Spring and the polarised stances taken by Qatar on one side, and Saudi Arabia and the UAE on the other. Qatar bet on populist Islamists represented by the Muslim Brotherhood and its offshoots. The Islamists' electoral victories in Tunisia and Egypt presented a brief victory for Qatar’s policies around the region as it aggressively deployed its soft power, represented by Al Jazeera’s critical coverage of Arab affairs, and hard power, represented by the country’s open and tangible support for Islamists in Egypt, Syria, Libya and Palestine. For their part, Saudi Arabia and the UAE stood for the antithesis of populist, bottom-up rule in the region and, after absorbing the initial shocks in 2011 and 2012, bankrolled the counter-revolutionary movements. Qatar and, notably, Al Jazeera, became some of the last remaining symbols of the Arab Spring. Fast forward to the present day and Qatar has managed to absorb the initial pressure imposed by the land, air and sea blockade and go on the offensive. Coming from a situation where it imported a substantial amount of its food and construction materials from the UAE and Saudi Arabia - these two nations had accounted for 13% of all Qatar's imports - the emirate has diversified its import sources to include Iran, India and Turkey. Turkey, rushing to meet Qatar’s food supply days after the blockade, has been expanding its trade into the market and is initiating a land trade corridor through Iran. Iran, for its part, has been fulfilling Qatar’s large appetite for construction materials ahead of the 2022 World Cup and the country’s rapid infrastructure expansion. Doha has also relocated its regional trans-shipment hub from Dubai’s Jabal Ali to Oman’s Sohar Port, creating the long-term infrastructure necessary to bypass the UAE entirely. Qatar’s growing military cooperation with Turkey, and recent international defense purchases is another element in the response to the Saudi-led blockade. Since June, Turkey has established a military base and deployed thousands of troops to Qatar. It has also conducted military exercises with its Qatari counterparts. Internationally, the emirate has been busy sealing defence deals with Italy and the United States. 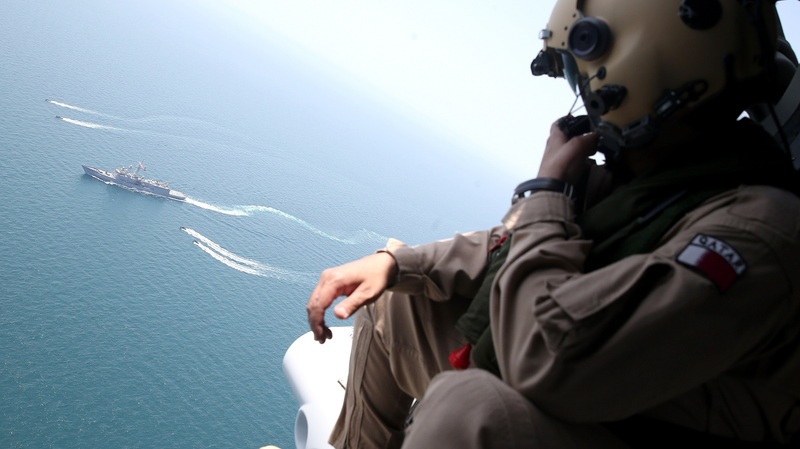 For Qatar’s defense ties with the US, it's been business as usual; the two nations conducted a joint naval exercise in June and the Al Udeid Air Base and the 11,000 troops US troops stationed there have not been affected by the regional crisis. Qatar, in another, well-orchestrated part of its response, has also started to shift the fight away from foreign ministries and official envoys to the more transparent arena of international organisations. The country has filed official complaints with the UN Security Council, the World Trade Organization (WTO), the International Civil Aviation Organization and the United Nations High Commissioner for Human Rights, among others. Qatar filed three WTO complaints against Saudi Arabia, the UAE, and Bahrain; interestingly electing to ignore Egypt, further marginalising Egypt's role in this dispute. In the WTO complaints, Qatar accuses the three nations of violating their obligations under various WTO-endorsed agreements, including some pertaining to the disruption of trade routes, international capital flow, and trade-related intellectual property rights. If Qatar is successful at the WTO it will take some time; the consultation, litigation, and potential sanctions process can take 2-5 years, or even longer. Regionally, the crisis has presented a golden opportunity for Iran, in particular, to capitalise on several political and economic fronts. Economically, trade data from June and July is yet to reveal the actual impact on economic ties between the two nations. Iran has been cautious in its political approach to the crisis as the two nations support conflicting sides in several regional conflicts, including that raging in Syria. However, Al Jazeera’s increasingly critical coverage of the Saudi-led Yemeni war is a clear indication the two nations' positions on certain regional issues can be bridged.